With Shillong being the Scotland of East, its Loch Ness (Umiam Lake, aka Bara Pani) is as gorgeous and deep as you can guess. 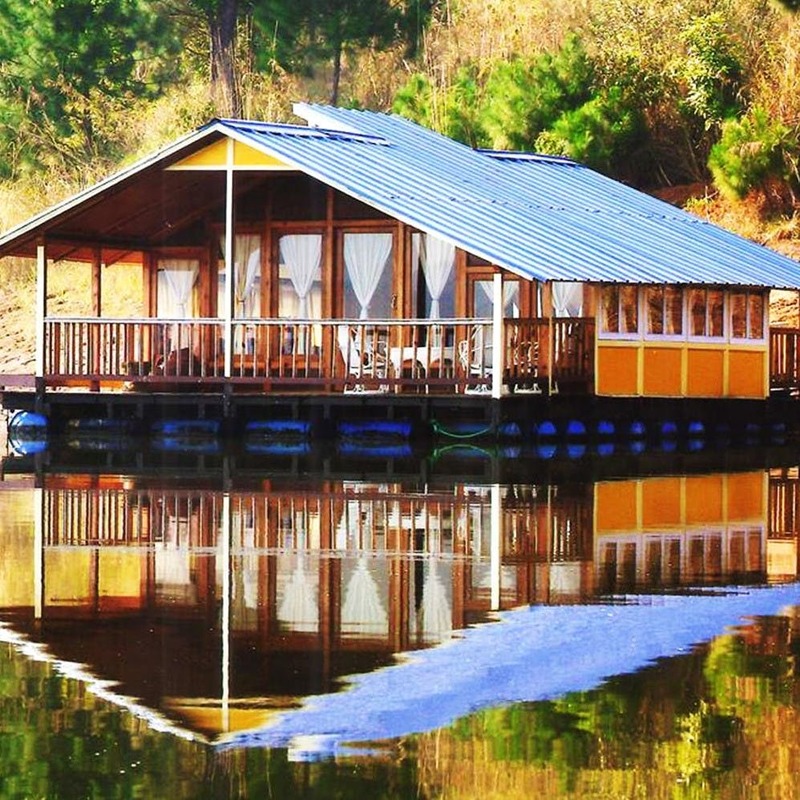 And while most just stops by to take in the beauty of this majestic lake that surrounds the solemn Khasi Hills, we’ve found a boathouse that floats on this lake and makes for a perfect spot for solitude seekers. It may sound like a place straight out of Gulliver’s Travels, but the Lumpongdeng Island is for real. It’s a solitary island that lies on the Umiam Lake and offers a great place for you to go fishing and trekking. And just off the island lies a beautiful boathouse that floats on the deep serene Umiam Lake—the only place where you can put up when visiting this island or if you are craving for a peaceful retreat. Though anchored to the island with a wooden raft, the boathouse in itself is an island that sits on the calm waters of the vast lake and is surrounded by the lush sprawling hills. It’s a photographer’s paradise and a bird watcher’s sanctuary. And most of all a solitude seeker’s go-to place, far away from the hubbub of the cities. With wooden interiors, gabled roof, floor-to-ceiling glass windows and a wrap-around porch, this boathouse is made of dreamy stuff and is insanely beautiful! You can sit out on the porch with a steaming cup of Assam tea and watch the clouds float by over the hills or can try fishing in the placid waters of the lake. Sitting in the middle of nowhere, this house is powered by solar panels, and has a caretaker to take care of your food and other needs. Though there’s just one room, extra mattresses are also easily available for rent, to accommodate not more than five guests at one time. Can't think of anything to fault really. It's like paradise for those wanting some peace and natural beauty. Once at Shillong, you’ll have to take a boat ride from the Water Sports Complex at Umiam (near the lake itself) to reach this boathouse. It’s best to inform the hosts at least an hour ahead of reaching the sports complex to arrange for a boat.